"A wonderfully spicy dish if you can find the spices necessary in your grocery store. Asafoetida is available in Indian food stores and some grocery stores. It has garlicky smell and should be used sparingly. Best served with rice or bread." Rinse okra and cut head and tail end off of each okra. 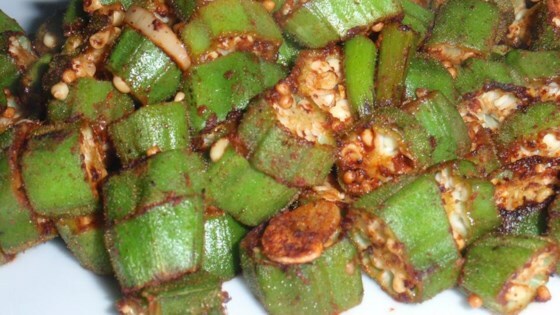 Chop okra into small pieces. In a small mixing bowl combine okra, salt, chili powder and asafoetida powder. In a medium size skillet over medium-high flame heat oil, add black mustard seeds. Cook until they pop. Add okra mixture to skillet and cover. Let fry 10 to 15 minutes. Serve hot. See how to make easy East Indian-style okra in the skillet. My husband made this and didn't change a thing -- it was perfect! Not gummy at all. Tasted almost exactly like the okra dish at our favorite Indian restaurant in Irvine, the Clay Oven. I love fried okra !! the only thing I canged, was I used corn oil instead of olive oil, left out the mustard seeds, & put the sliced okra into some breading before I fried it!! I used 2 cloves garlic instead of the asafoetida powder. I also used vegetable spray instead of the oil. This great tasting combination makes me want to make more soon!